Alright, so maybe this post isn't about cookies or egg nog or mistletoe, but it is about peace on earth and goodwill to, well, in this case, chickens. And us, really. 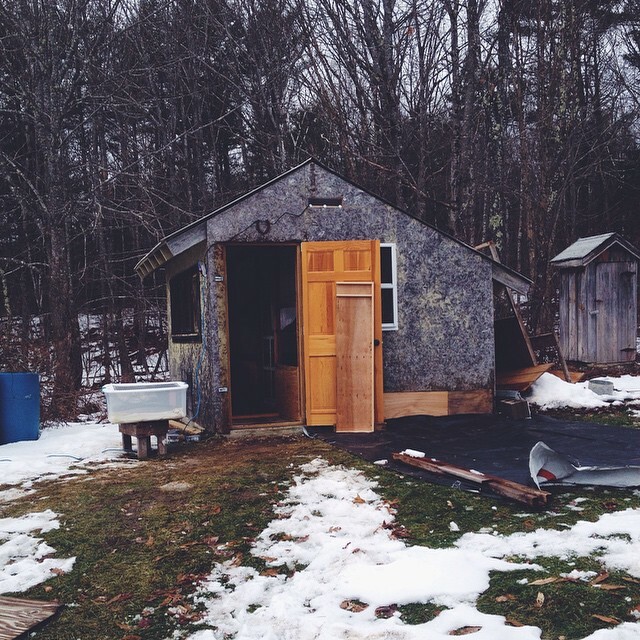 After #snowvember, we became quite concerned about how winter ready our chicken were (they weren't) and we began the project of overhauling the existing coop. While we had hoped to get them moved in by Thanksgiving, we had to wait until today. For one, we had to wait for the weather to clear for us to get a couple of yards of sand delivered, since we are using sand as the bedding in the chicken coop. Getting the sand delivered was extremely affordable and easy. Getting sand from the driveway to the coop was a bit more of a chore via wheelbarrow over choppy ice and snow, a job Adam mostly handled. 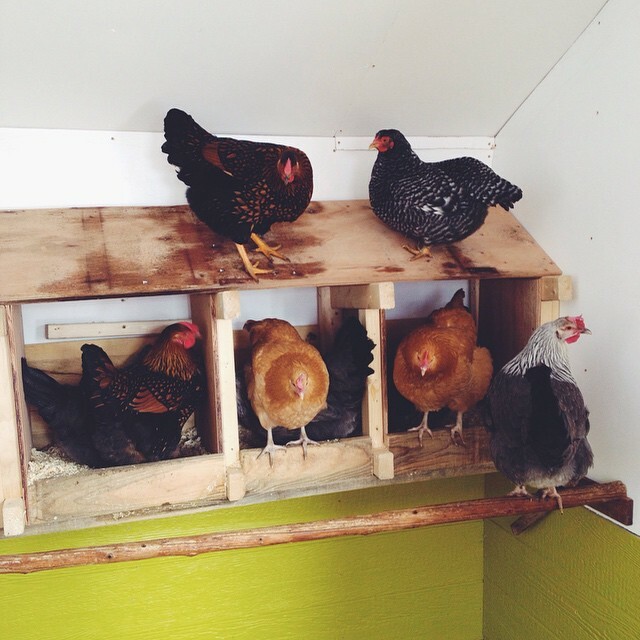 Once that was done, it was a matter of installing a roost, hanging waterers and feeders, installing the nesting boxes (the ones from the chicken tractor, just to keep the chicken stress to a minimum), and it was time to move the chickens. So in the chickens went, two by two, into their old brooding bin, and they were carried to the new coop. 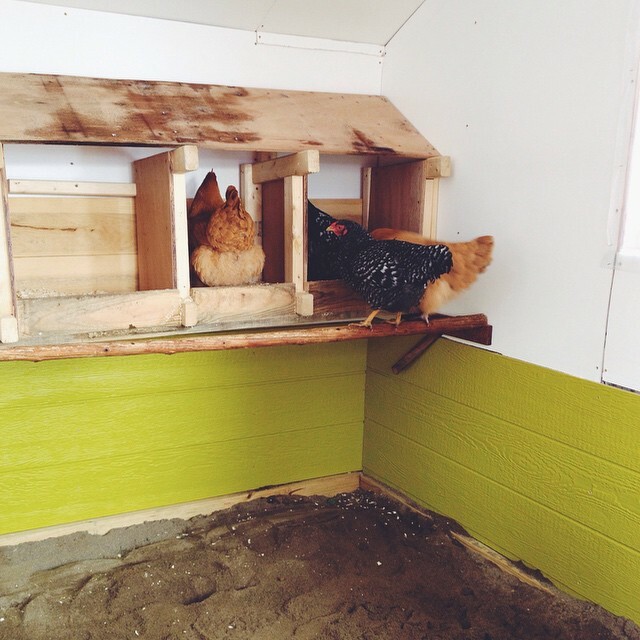 The chickens acted like the sand was lava and flew to the roost and nesting boxes, including the slant roof that was meant to deter roosting, and all congregated there, initially. It wasn't until the ever-daring Speckled Sussex pair, Edie and Edna, began to explore, that the others found their courage to do the same. Soon enough, everyone was happily eating scratch grain off of the unfamiliar sand. The coop exterior will have to remain a terrible, hideous mess (PSA-never, under any circumstances, use OSB board as exterior siding). It does, however, have two new storm windows and a new, salvaged solid door with real doorknob. The inside has had all the old, moldy, mouse feces-infested, insulation and packing peanuts removed, new insulation and painted walls have been applied, and there are two hardwire cloth vents. Alex built a partition so that we have some storage space inside, for grain and supplies. We plan to do a bit more interior painting and work in the spring, also, and we will be replacing the windows on the south wall. The coop should be reasonably warm and well-ventilated, bright, and roomy for our fourteen chickens. 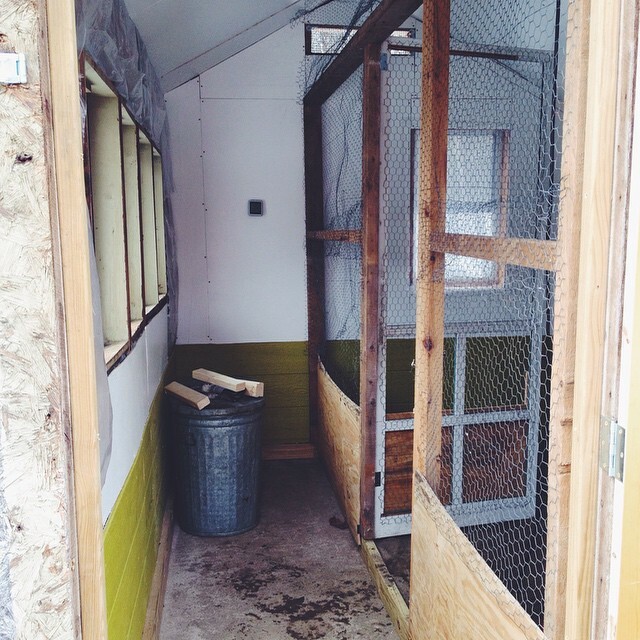 We will be moving their run (hut) over to the side where the chickens will be able to access it from a pop-hole. In the spring, we will build a big, permanent run off their coop. With this coop remodel, we've given the chickens spiffy new digs, but the gift of peace of mind to ourselves for the winter, as well.